United Sign: There! Look Down!! You might have signs hanging all over the lot. You might have things dangling from the ceiling. 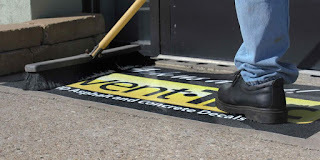 You may even have point of purchase materials at eye level everywhere you turn, but what do you have under their feet? Have you stopped to look lately, quite often, people are looking down at their mobile device and not paying attention to traditional "eye catchers" you employ to get their attention. We have the solution for that! Event-Trac is a durable, and fully customize able product that adheres to concrete and asphalt as well as tile and other had floor materials and is designed to stand up to the rugged day to day use of it in it's placement and when you're ready, it comes up with relative ease and convenience. You can use this product to direct people around your event. You could send us your artwork and customize what you'd like Event-Trac to say or you can click the picture below to see a selection of ready made themes to help you get started talking to people who are looking down!